When I was a kid, I saw this written on the wall of my School, “Acquire knowledge from the cradle to the grave ~ Holy Prophet”. That gives me a great inspiration and motivation to study well and seek education on the greater level as possible. This is the base where I started by journey and currently doing Masters. We firmly believe Education is a powerful weapon, which can drive any nation from troubles to comforts, from dark to light, from depression to satisfaction and from mental sickness to mental compassion. Malala Yousafzai, 14 year old girl was shot and get injured is now a public figure and got recognition by the World due to her bravery and activism for the girls education. She once said, “”I’m ready for any situation. Even if a terrorist comes to kill me, I will tell him he’s wrong – I won’t back down”. The words are outspoken and determines a great courage of the bravest girl. Malala is the name of struggle against narrowed thinking, hate, intolerance, violence and militancy – a struggle from within. She is way more important than so-called silent majority because she signifies the shades of indigenous resistance that is the most vital aspect to get rid of extreme thinking. She stood up when her school was closed by the intervention of Taliban and Army in her area. She didn’t lose her hope and waited for her school to be opened soon. She believed and her school was opened. She always talked about the education of the girls and children who were forced to not to go schools because of a specific thinking, which causes deprivation in the area and they never wanted girls to go to schools. Malala, the brave daughter of the nation, stood up against this thinking and wanted every girl to go school and reach education. Her thinking was totally illuminated by the principles of Islam, which stressed on the education. 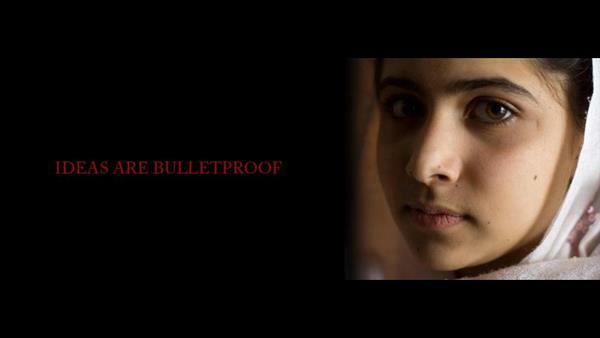 But the coward Taliban attacked her, because they were so feared of her and considered her as a big threat to them. A beautiful face, without any weapons, how can she be a danger to the barbarians and butcher extremists? Yes She can be dangerous to them, because once she get education by following her religion, Islam. She will talk about Human Rights, Women Rights, and advocate against the cruel traditions of the extremists, which believes in burning girls, and burying the alive girls without any sin. Yes, Malala will be dangerous for them, because she will grab the attentions of the world to the butchery of the extremists and will shout for the human rights. Taliban and other terrorists organizations are the threat to the global peace and security. They are like a cancer to our civilizations and modern history. TTP in Pakistan has killed many innocent civilians. The most of the population of the Pakistan comprises females. How can the huge population of the country can be hostage of this narrow thinking? Pakistani civil society, Youth Organizations, Government and all stake holders must speak up loud for the rights of the important pillar of human being, girl. We are not living in the age of the stone. Its 21st Century and human being is exploring new planets and searching life on them and still planet earth is consist of the depressed thinking which don’t want them getting education. A problem cannot be solved unless it is recognized as a problem in the first place. Condemnation of attack on Malala’s life would suffice if only coupled with unequivocal discontentment of the committers who have come out in open time and again. The whole Nation have to stand up for the education of the Girls and lets every one of us become Malala Yousafzai so that fear of the extremists can become as worse as it can be, so that they die in the fire of depression and disgust. In the end, My message to Taliban and Extremist Thinking against Education!!! We will oblige our Religion, Islam and will educate every girl and boy. So Be Afraid! Our Holy Prophet Peace Be Upon Him said, “Seek Education from the lap of your mother to the graveyard”. By promoting education in our country, If you think, we are Pro-West and Pro-Americans , Think whatever, Do whatever you can!! We will spread education and make it reachable to every individual in Pakistan and whole World! InshAllah. Islam believes in Peace and Tolerance and gives rights of Education to both men and women. This is the Islam. Your agenda will demise and you will bring to Justice very soon.